The Lutheran Church Missouri Synod. Sunday Service: 8:00 am and 10:30 am. Holy Communion is celebrated every Sunday morning at both Sunday Services. Adult Bible Study: is held at 9:15 am between the two Sunday services each week. K-High School bible classes: are held at 9:15 am between the two Sunday services each week. Heavenly Host is a vibrant congregation that has been serving the Cookeville, Tennessee area and surrounding communities since 1967. If you find you have a curious or sincere interest in our church family or school, we prayerfully invite you to contact or visit us as the Son of God, Jesus Christ leads you. The Sunday before Jesus was crucified by the people, they honored and adored Him as their Lord and king with palm branches. We remember this as a beginning of Christ’s bitter walk to the cross. Why did the people honor and adore Jesus on Palm Sunday and then kill Him on Good Friday? When Jesus rode into Jerusalem on Palm Sunday, the people began to praise and honor Him as their king. They believed Him to be a powerful leader who would overthrow the Roman government and restore Israel. When Jesus did not do this, the people wanted Him crucified. You and I know what kind of a king He is. Jesus is a king who came to die for the sins of His people. He came to pay the price, for our sins that we could never pay… His painful death stands as a reminder, of his victory over sin and death. Next we joyously celebrate His triumphant resurrection into Heaven on Easter Sunday! In order to serve those who are suffering or in need of special prayers, we are offering you the ability to submit your prayer requests to our prayer ministry. Together we pray for you, your family and loved ones. We want you to know the comfort of knowing others are also praying with you. Submit the first and last name of recipient in need of prayer. After your name, add your relationship to recipient. Contact information, email address or phone number, please. Pastor only, Pastor and elder only, Prayer Chain, Announcement at Church, Print in the Weekly Bulletin. Please add any additional details you think we should know. Your prayer request is being submitted to our prayer ministry at Heavenly Host Lutheran Church where it will be routed in the direction of your request. The peace of our Lord be with you. Click on the above calendar to open up a monthly calendar where all of our on going events in and around Heavenly Host Church and school are outlined for you. Take a look, you will find some new and exciting interests to involve, or highlight your life. When disaster strikes, Christians look for ways to help those who are in need, whether it means lending a helping hand or making a monetary donation. 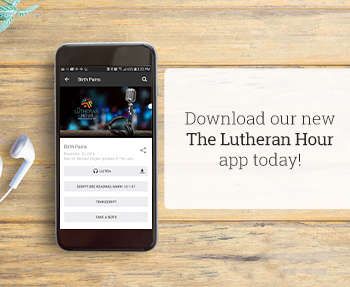 You can take The Lutheran Hour® program with you anywhere you go! An updated mobile app is now available for the world's longest-running Christian outreach radio program! Click here to get the new app. Sign up now for our special weekly email! It's a brief email sent to you detailing the upcoming Church events and activities of the week. It is intended for present church members, past members, future members and those interested in learning more about our church or school. Sign up today! Enter Here to Sign up for Our Weekly Email! Please type email address to send Church email. Welcome to Heavenly Host Weekly Email and thank you for signing up! You will now be receiving your weekly Church email very soon in the email account you designated. Have a very Blessed day! Please note that by subscribing to our mailing list your name and email is only used for the purpose of the HHLC mailing list and will not be shared by other parties for distribution or reuse. You can also opt out any time you choose.